The party is a by-invitation-only milonga, hosted by Sandra Kistler and Gregory White at their exquisite home in the Oakland Hills. It started about two years ago after the couple had met and decided to open the vast space of Sandra’s house to the tango community. Their aim was to create a monthly event in the tradition of a European-style salon. 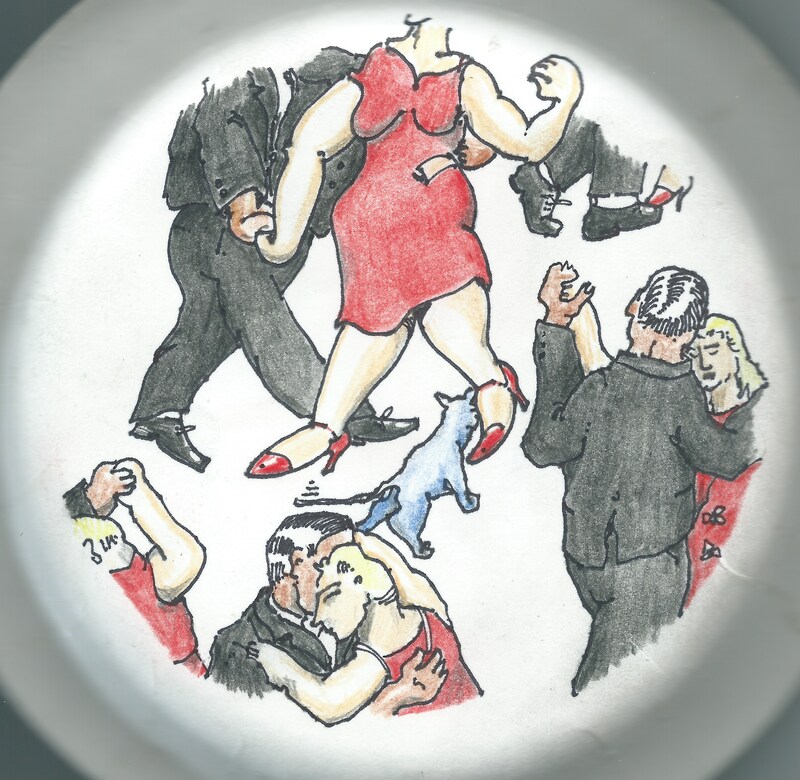 “We found that a lot of people in tango don’t actually know who they are dancing with,” says Greg, “unless they already are good friends.” Add to this the fact that people don’t get together for big dinners — and the idea was born for the “houseTango”. They started to invite a number of dancers from the community for “dinner and dance” on one Friday of the month. It immediately drew not just their friends, but also a large number of tango aficionados from the Bay Area tango community. The intimate setting of a milonga at their private home — which presents itself as the perfect space for entertainment with a large dance floor, elevated stage area for musicians, a grand piano, and spectacular views of the Bay — was an immediate attraction, just as were the culinary delights. And the monthly parties are only one aspect of what has now become a much larger project called “houseTango”. “It is a community of musicians, dancers, teachers, and organizers who are related to Argentine tango,” as Greg formulates it. It includes the monthly milonga, a scholarship for promising tango dancers, and a soon-to-come website for tango dancers. “How does the scholarship work?” I want to know. Greg explains that both he and Sandra pick an aspiring young tango dancer: somebody who is talented, and they support him or her. This month’s scholarship was awarded to Dina Zarif, a young vocal talent and beginning tango dancer who sang to piano accompaniment during the salon at the house. Sandra Kistler had acquired on behalf of “houseTango” the scholarship for Dina in the form a full-day festival pass for the upcoming Official USA Argentine Tango Championship. The certificate was presented by Andrea Monti, the organizer of the Tango Festival. But there is a lot more to come. The next goal for “houseTango” is a comprehensive website which, according to Greg, is going to be not only an improvement of the long-existing and popular TangoMango site but also a social media site for tango dancers. People will be able to create their own profiles, post news about themselves, and search for tango events. “The site will be geo-mapped”, explains Greg, “so people can find their way conveniently to events nearby or far away.” They should also be able to see which of their friends are attending which event at any particular day, thereby making it easier to connect with their favorite dance partners. The site will have different sections for social dancers and professionals, organizers and performers. There will also be tickets for tango events on sale. “We want to make it a common marketplace for tango dancers”, says Greg, “where people can find everything without having to browse the web.” The site has its own domain name: www.housetango.com and is already in its beta version.